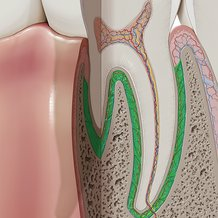 -the root, of which a tooth can either have a single root or multiple roots. The enamel of the tooth is the whitish to yellow outer layer of the tooth that is extremely hard and quite durable in healthy teeth. Found underneath the enamel layer of the tooth is a slightly softer modification of osseous tissue called dentin. Beneath the dentin is the pulp chamber or pulp cavity which contains the tooth's blood vessels and nerves. 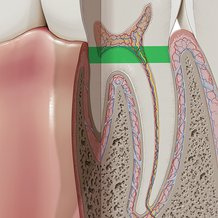 These vessels are the dental arteries, dental veins and dental nerves or dental branches. The root canal is the continuation of the pulp chamber into the roots down to the apex of the roots. 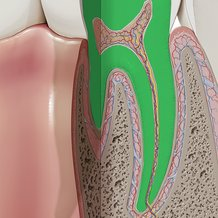 The apical foramen of the tooth is located a the apex of the root and it is here that the structures of the of the pulp chamber enter and exit. In the area of the root, the outer most surface of the tooth is covered by cementum rather than enamel. 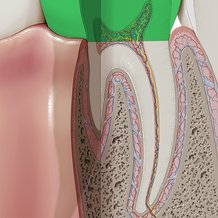 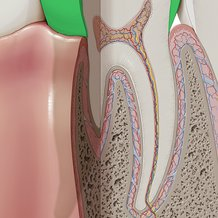 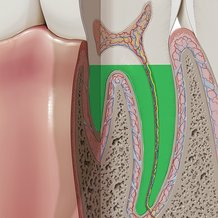 Surrounding the cementum is the periodontal ligament, which anchors the roots of the tooth to the alveolar bone. 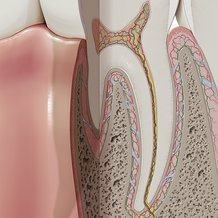 The soft tissue surrounding the tooth is known as the gingiva or the gum. 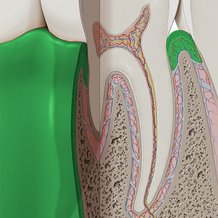 This soft tissue includes the pars fixa of the gum, the pars libera of the gum, the interdental papilla and the lamina propria of the gum is the loose connective tissue underlying the gums.